100 steps to the beach. Four blocks from Secrets night club. One block from the Convention Center. Shopping in walking distance. Enjoy this 'Home Away From Home' with your family. Second floor end unit 205 on 44th Street with Ocean and Bay views. Updated each off-season: kitchen appliances, granite counter tops, cabinets, tile floors, hardwood floors, carpet, washer and dryer and bathrooms. New mattresses in 2014. New sofas added in 2016. Linens are NOT provided. Building has an elevator for easy access. There is a large indoor pool open from May to October which is being update winter/spring 2018. Master bedroom with a king bed opens to a large balcony with an ocean view. Unit has an extra large shower in the master bedroom. Second bedroom has a queen bed and twin bunk beds. Third bedroom has a queen bed and double/twin bunk bed. There is also a sofabed located in the family room. All 3 bedrooms have TV's and the large family room has a TV/VCR/DVD. There are 2 assigned parking spaces and a storage locker for your beach gear. Watch the sun rise and set from your private balcony...The perfect place to enjoy the Beach!! Renting to responsible seniors at a different rate than families with security deposit and parental signatures. Weekend rates available at 250.00 per night with 2 night minimum stay, plus tax and 110.00 cleaning fee. I have owned this property for 10 years. It was always a dream for me to live at the beach and with this condo I can on the off season. We enjoy every minute we are there and have everything stocked to it is our home away from home and hope that you will treat it the same. Kitchen is fully stocked. All of the amenities of home. This condo is updated yearly. fully stocked for those who wish to cook. We were 3 moms and 4 kids attending a cheer competition at the convention center down the street and this was the perfect spot for us. The place was clean and cozy and was stocked with appliances, cutlery, dishes, etc as well as cleaning supplies. The beds were comfortable (make sure you bring linens, including pillowcases, and towels!!) It was pretty quiet. You could hear some traffic from the front bedroom but it wasn't to bad. There is a fantastic large balcony and it's a super quick walk to the beach, convention center, and restaurants. There is plenty to do around here and we would love to stay here again. All the kids are already asking to go back! The owners were great to deal with. They were accommodating and quick to respond to messages. Thank you for the wonderful review. Glad you enjoyed your stay and can't wait to rent to you again! The place was nice and clean! The owners did a wonderful job keeping this place up to date. The kitchen and living room area gets an A+! Glad you felt my place was great. I try to have it be a "Home Away From Home"
I recently stayed at this beautiful condo for a weekend with 6 of my girlfriends. Upon arrival into the condo we were blown away, the pictures do not do this place justice! It is very spacious and very well kept! Owners are very responsive to messages and very accommodating. 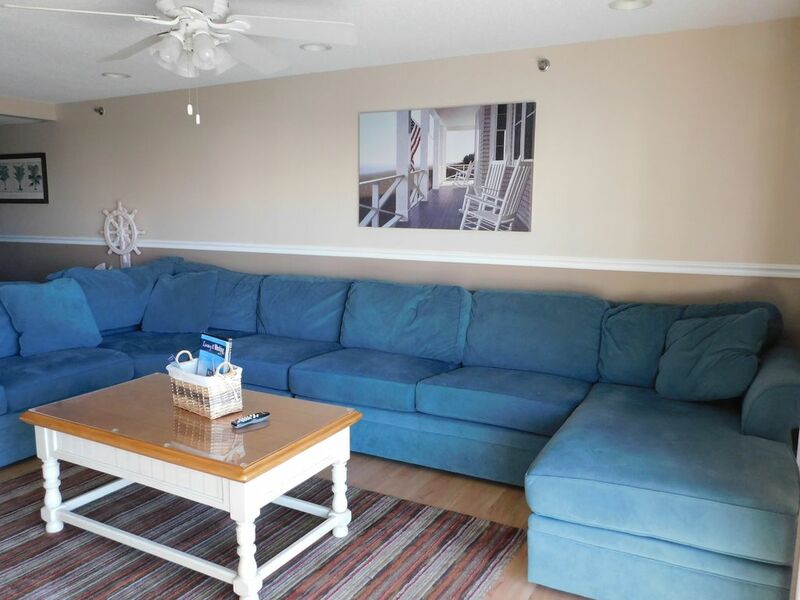 The location is great in Midtown OCMD, just steps from the beach and close to restaurants and Seacrets. Not really an issue but something to keep in mind for families, the bedroom with the double bottom bunk bed is on Coastal Highway, there is some outside noise in the late evening as this is the main strip in town. Only other suggestion I have to the owners is to do keyless entry or replace the door knob as it stuck a little when locking and unlocking the door. Also, labeling the keys in the condo would be helpful to know which key was for the pool, locker, etc(took a few tries to figure it out). These are minor things in an otherwise fantastic condo, highly recommend for families or a group of friends! Thanks for the wonderful review. We are planning on replacing the locks in the fall during the off season. We try to label the keys but the labels fall off. Maybe I will get the colored rings for the keys and leave a note what each color is for. Location was perfect! Ocean on one side, bay on the other. Walking distance from Seacrets and many restaurants. Extremely clean and had everything we needed to make our stay epic. I highly recommend this to anyone and everyone!